Yoma Strategic Holdings Ltd., an investment holding company, engages in real estate, automotive and heavy equipment, consumer, tourism, and agriculture businesses in Myanmar and the People’s Republic of China. The company’s Real Estate Development segment develops and sells land and properties. Its Real Estate Services segment provides project management, design, and estate management services, as well as property leasing services. The company’s Automotive & Heavy Equipment segment supplies and leases motor vehicles and automotive equipment; and provides maintenance services. Its Consumer segment engages in the operation of quick service restaurants; and food and beverage distribution and other retail businesses. The company’s Tourism Services segment operates hot air balloons, as well as offers related hospitality services. Its Agriculture Activities segment is involved in the cultivation and management of plantation estate, as well as development of related businesses and services. 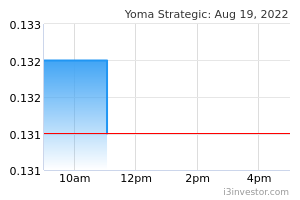 Yoma Strategic Holdings Ltd. is also involved in KFC franchisee and advertising activities. The company was formerly known as Sea View Hotel Limited and changed its name to Yoma Strategic Holdings Ltd. Yoma Strategic Holdings Ltd. was incorporated in 1962 and is based in Singapore. charles pang kah keet TRY TO BUY IN AT 0:45SEN, HOPE WILL GO SOMEMORE. garfield282004 wait for the right issue 1 for 4, i'll see this stock for long term investment. gerard_tee when will be the right issue? dusti Designed as a conglomerate, but will the Myanmar market grow fast enough ? Their most productive manpower is probably all over SE Asia. LaoLiu Any opinion for Yoma Strategic? good to invest? LaoLiu Uptrend ongoing, don't miss this boat.. BOOSTED by higher fair-value and bargain-purchase gains on investment properties and acquisitions, Yoma Strategic on Friday posted a 28 per cent year-on-year rise in net profit to S$8.16 million for the fourth quarter ended March 31, 2015. Yoma also announced senior management changes. The profit attributable to equity-holders also came on the back of higher gross margin. While Q4 revenue was up just 0.1 per cent at S$27.56 million, gross profit was 2.2 per cent higher at S$13 million. Net profit, including S$3.71 million (FY2014: S$1.68 million) for non-controlling interests, was S$11.87 million, up 47.5 per cent. The quarter saw net other gains doubling to S$11.38 million. Contributing to this was a rise in fair-value gain on investment properties from S$5.19 million to S$8.03 million. The latter stemmed from the revaluation of its investment properties Building A5 in Star City and Lakeview G in Pun Hlaing Golf Estate in Myanmar. For the financial year ended March 31, 2015 (FY2015), Yoma' s profit attributable to equity-holders grew 71.1 per cent to S$28.05 million while revenue rose 10.4 per cent to S$110.93 million, mostly due to higher revenues generated by its automotive and tourism segments. 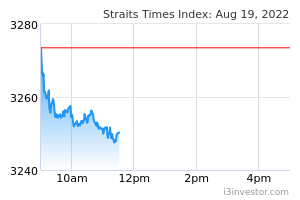 Earnings per share for the fourth quarter stood unchanged at 0.52 Singapore cent. Yoma announced that Andrew Rickards will be stepping down as chief executive officer and executive director after the company' s annual general meeting on July 27. This is to " to implement succession plan" . Taking over is Melvyn Pun, son of Yoma' s executive chairman Serge Pun. Melvyn will step down as alternate director to the elder Mr Pun. Mr Rickards will stay on as an adviser to the company until Dec 31, 2015. LaoLiu Yoma Strategic Holdings - Christmas comes early ! Axiata Group to acquire Telecommunication Tower Leasing Business from consortium involving Yoma Potential sale of Digicel Asian Holdings Pte Ltd (DAHPL) to Axiata Group Bhd. Yoma Strategic Holdings (Yoma) announced that its partner, Digicel Group Limited, has entered into a conditional sale and purchase agreement with edotco Group Sdn Bhd (edotco), a wholly owned subsidiary of Axiata Group Bhd to dispose of its 75% interest in DAHPL at an agreed enterprise value of US$221m. DAHPL is joint venture company between Digicel Group (75% stake) and Yoma (25% stake). The JV company owns Myanmar Tower Company (MTC) and is involved in development, construction and leasing of telecommunication towers in Myanmar. The conditions of the Proposed Transfer include a written consent from Yoma and approvals from the regulatory authorities in Myanmar. Potential sale of its 25% stake could reap gains of US$20m. Based on the agreed sale price, Yoma’s equity stake is worth an estimated US$20m above its book value. We understand that Yoma’s management is evaluating its options and is in discussions with edotco. At this point, a sale of its 25% stake in this JV company is uncertain. In our view, a sale will be the optimal outcome as it will further streamline the group’s focus towards its core businesses of real estate, consumer and automotive. We have not ascribed a value at this point and if a sale does materialise, Yoma is expected to realise a gain of 1.1 UScts a share. Broker's report on YOmaaaaaa! from edge markets.